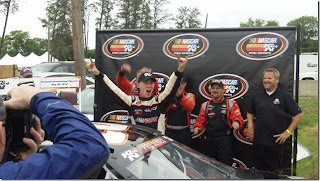 The NASCAR K&N stock cars raced 50 laps on the Brainerd 2.5 mile course, that was 10 laps more than the Trans-Am series cars, most cars stopped between lap 25 and 30. The race took 1 hour and 32 minutes to complete. A nice field of 19 cars raced and only one accident, Anthony Giannone spun just before the bridge in turn 12 and was stuck in the sand trap, numerous other cars skimmed that trap after over running the turn with no major trouble. 16 yr old point leader Dylan Kwasniewski (photo above) spent most of his free time before the race kicking a soccer ball in the pits and acting like a teenager. Once he strapped into the car he was very impressive, setting fast time in practice, even with very limited experience on a road course. He was set to win the race until they lost second gear and lost the lead coming to the white flag lap. Much of the passing on this day was made in corners 4 & 5 after the big high speed swooping corners 2 & 3. BIR added brand new bleacher seating in this area and at the end of pit road, just before the bridge. The old asphalt section of the course will be replaced before the K&N series race in 2013, much of this tar was laid down in 1968 and has lost grip, this means the high speed turns in 2 and 3 will be even faster next year. The lead swapped between team mates Kwasniewski and Pursley 3 different times, Pursley was better at the start of the race, after the restart and after his pit stop then his car would tighten up and Kwasniewski would pass him making for exciting racing up front. 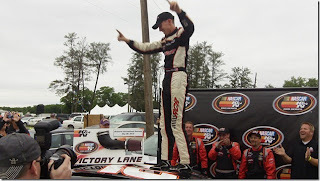 Eventual winner Michael Self was so excited in victory lane after his first career win, he jumped up on the roof of his car, to the dismay of the tech officials. The storm clouds stayed around all day on Saturday with a heavy downpour cancelling qualifying, the race weather was fine but, shortly after the victory lane celebration it started raining again. BIR track owner Jed Copham (in photo above with winner Michael Self) said in victory lane that he would like to make this race an annual event. (BRAINERD, MN) May 26,2012-----Michael Self might not be a name familiar to race fans in the Midwest, but he already has caught the eye of one prominent team owner and with a come from behind win on the Competition Road Course at Brainerd International Raceway in the NASCAR K & N Pro Series West division, Self might well be on his way to bigger things in the coming years. Due to rain washing out qualifying, the field was set by points for the inaugural Brainerd 125. Starting up front was sixteen-year-old points leader Dylan Kwasniewski, flanked by veteran and defending series Champion Greg Pursley. As the field took the green, it was Pursley who took the lead with Kwasniewski right behind. The battle for the top spot intensified as Kwasniewski pressed hard and took over the lead a handful of laps into the 50 race. 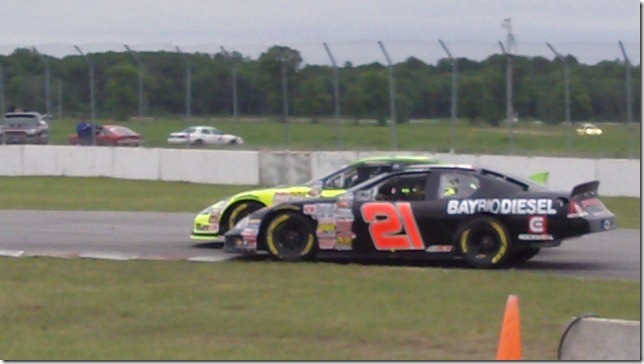 Anthony Giannone’s off track excursion brought out the race’s only yellow on lap 6. On the restart, it was Pursley regaining the lead as Kwasniewski again challenged hard. Just like before, a couple of laps into the run it was Kwasniewski taking over the point. 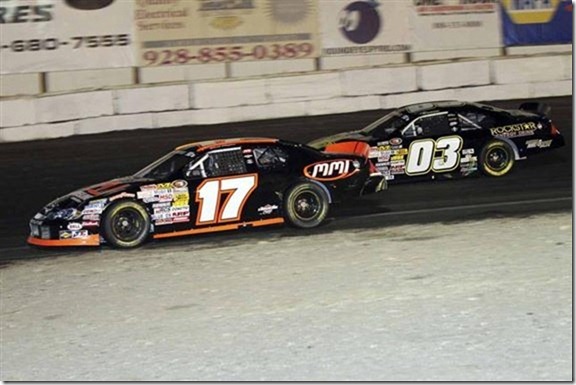 Pit stops played a role about two-thirds of the way into the race as both leaders pitted for fuel and Pursley won the race off pit road and again took the lead. For the third time, it was Kwasniewski making a hard charge and once more he took the lead back. Pursley’s car began to fade at that point as Self slowly began to reel in the front pair. With nine laps remaining, Self moved past Pursley and then set his sights on Kwasniewski. Kwasniewski looked to be well on his way to the win, however transmission problems slowed his pace, opening the door for Self. With less than a lap and a half remaining, Self made his move in turn nine, which is known as the “Keyhole” turn. 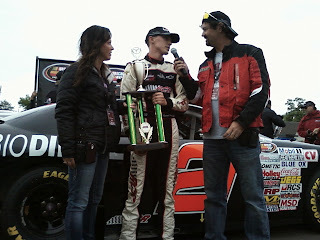 Self was able to take the lead and finish off the sprint to the finish to score his first NASCAR K & N Pro Series West win. “Before the race, my crew chief and spotter pounded into my head that I need to be careful and cautious and run cautious laps and that’s exactly what we did,” said the 21-year-old Richard Childress Racing developmental driver. 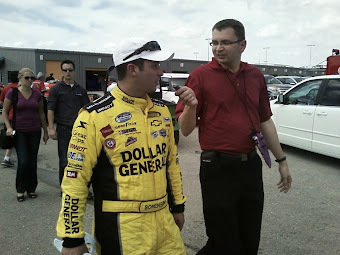 “The 03 car (Kwasnieski) had a big, big lead on us and we started to track him down and he made one little tiny mistake and that’s all it took and we took advantage of it.” Pursley managed to nurse his car home a distant third while Derek Thorn and David Mayhew rounded out the top five. 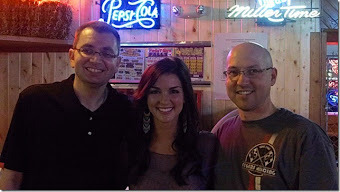 Listen for Speedtalk on 1360 Saturday mornings 10-11am on KRWC 1360am. No, it’s not Dale Jr. or some guy named Jimmie, but a real NASCAR touring series is making a stop this weekend at Brainerd International Raceway. The NASCAR K &N Pro Series West will be making its first ever appearance at the historic Brainerd track on Saturday May 26th. 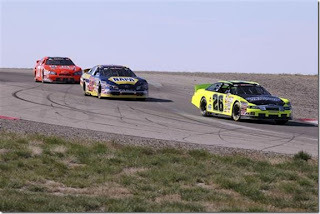 The 50 lap (125 mile) event will not only be the first for the series, but a first for the drivers as none of the participants have ever driven the 2.5 mile Competition Road Course before. The K & N Pro Series West has been around since 1954 with its roots planted firmly along the west coast. It’s been known by a few different sponsored names, but the series has always been a top tier division for racers from the country’s left coast. Many notable drivers have used this series as a stepping stone to greater success in many of NASCAR’s other top divisions. Ron Hornaday Jr, Kevin Harvick, Derrike Cope, Chad Little and Brendan Gaughan are just some of the names who have had success in the series before moving on. Today the series has a mix of young up and coming drivers along with a good contingent of seasoned veterans. 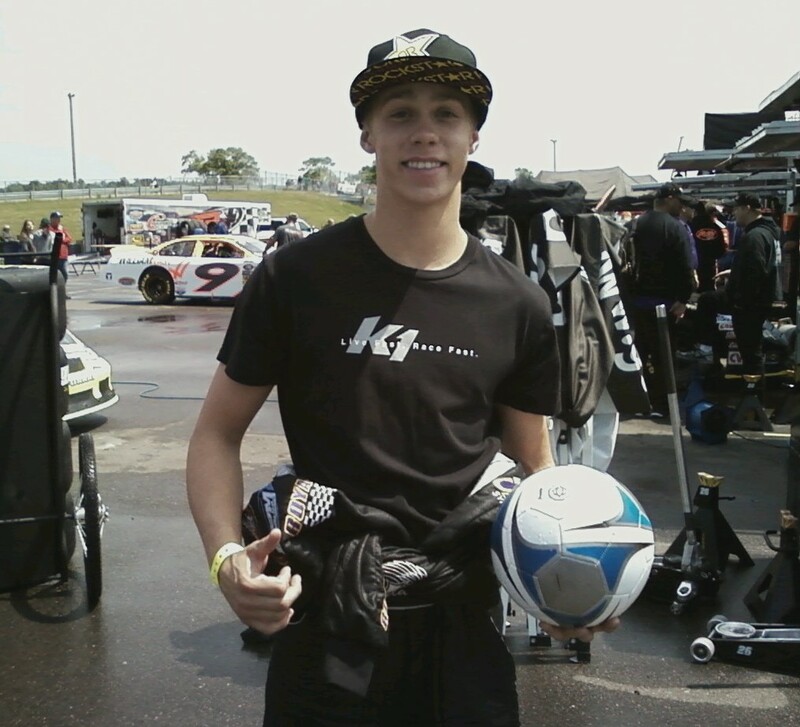 One of the young drivers to watch will be sixteen-year-old Dylan Kwasniewski (#03 above) who currently leads the point standings following last week’s race at Iowa Speedway. 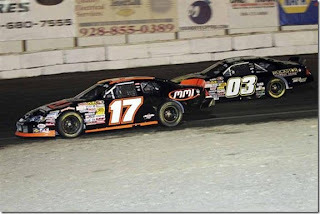 That race was a combination event between the K & N West Series and its counterpart, the K & N East Series. 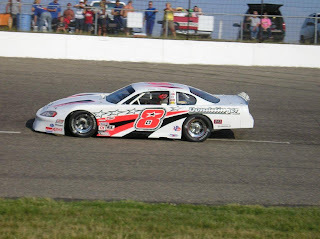 Forty-four-year-old Greg Pursley (#26 below) is the defending series Champion and currently sits 15 points behind his teammate Kwasniewski in the standings, just six races into the 15 race schedule. Pursley won a road race earlier this year, the Utah Grand Prix. 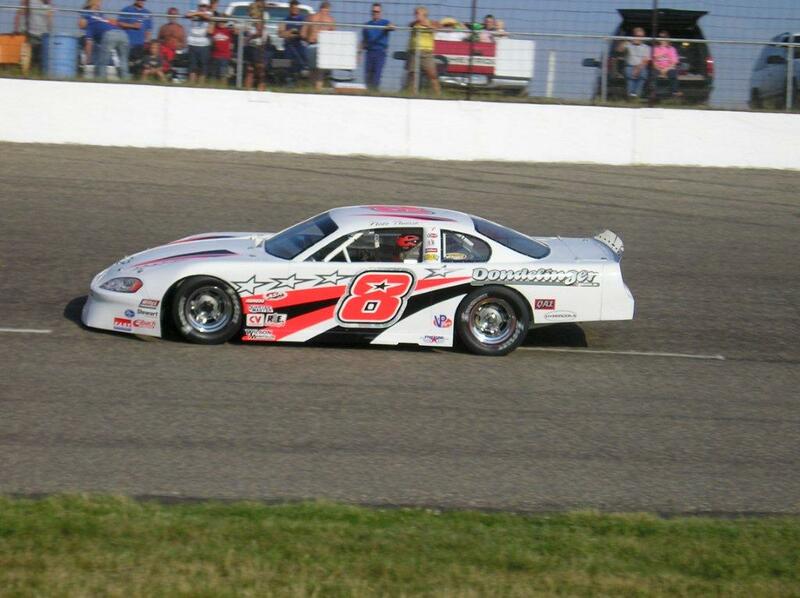 Other notables to watch at Brainerd will be (#17 above) David Mayhew, who has made a few Nationwide Series starts, Eric Holmes who has four-runner up finishes on road courses and veteran drivers Jonathan Gomez, Carl Harr, Daryl Harr and Brett Thompson who has 115 career starts. 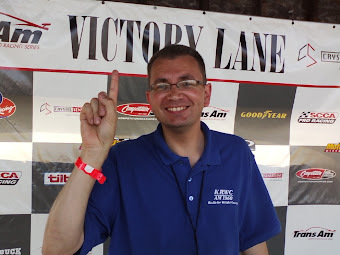 The NASCAR race is just one event during the weekend at BIR with Drag Racing and SCCA Road Racing also included in the Friday-Sunday Street Car Showdown. 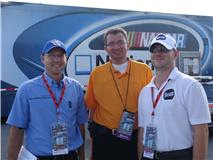 The NASCAR events will run Saturday only. NASCAR practice is from 9:45-10:45, qualifying is slated for 1:45, with the race set to take the green at 4:40. Remember, that since this is a road course, the race will be run RAIN or SHINE. The super speedway races at Daytona and Talladega are called wild card events because you never know what will happen and unlike most tracks, any car entered has an opportunity to win. A team that wins one of these events might be called lucky, but when you win two, that means you are doing something right. 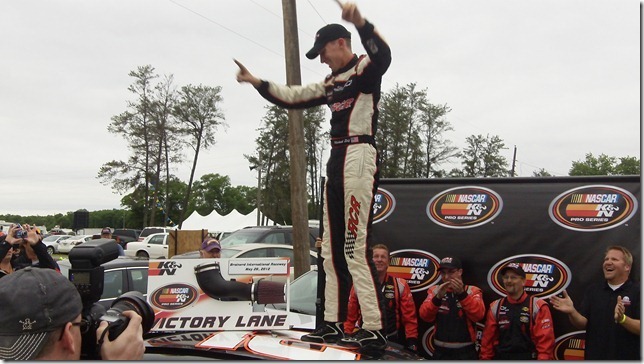 MN based ARCA team Win-Tron racing has now won a pair of Super Speedway races after Brandon McReynolds won at Talladega. 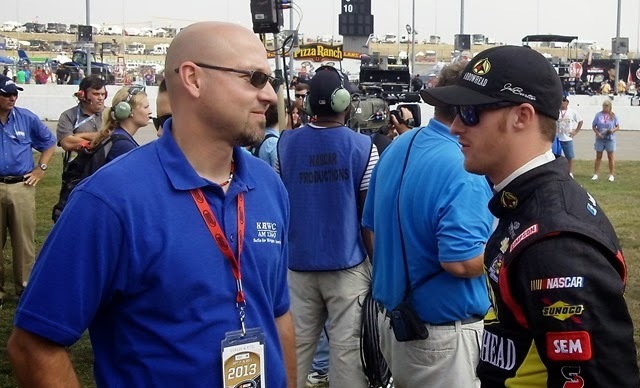 Brandon is the son of former NASCAR Crew chief and current broadcaster Larry McReynolds, he even has "larry's kid" printed on the roof of his race car. 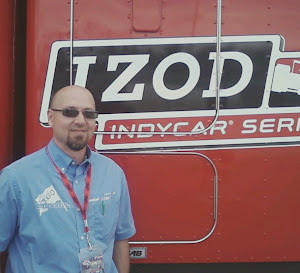 Brandon is quickly earning respect, "Brandon is a hard working racer," said co-owner of Win-Tron Nate Thiesse "he is very committed, smart and passionate about racing." Larry McReynolds was in the pit box during the win but was not calling the shots, "Larry plays the part of THE DAD during race day," said Thiesse "guys told me he reached for his head-set mic a few times but never said a word. He is a class act." Win-Tron racing has a relationship with Turner Motorsports, current Turner driver James Buescher won in a Win-Tron car at Daytona back in 2009. Kevin Cywinski's three ASA National titles are well known but Nate Thiesse (photo above) was also a very successful racer around Minnesota on the dirt in the 90's and asphalt in the 2000's. 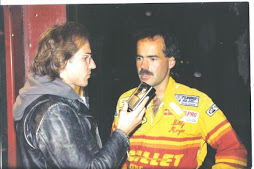 He won over half the races he entered at I-94 Raceway but never ran for a point title, instead he had his sights set on a different goal. 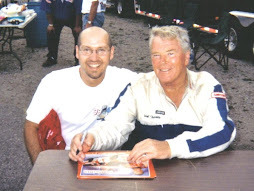 He is the first driver that I remember using a in-car camera, they would review the race from multiple angles immediately after every race night, win or lose. That is a work ethic that has carried over to Win-Tron racing. "Its all about reparation at the shop," says Thiesse "Its not just one thing, its the little things that make the difference, but passing on the last lap, that is all driver." 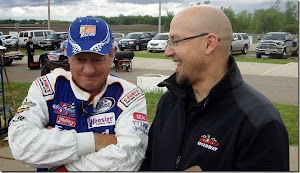 Thiesse is happy to finally be racing close to home on June 2nd at Elko Speedway for the first ever ARCA event in MN, "its exciting for us, normally we are the ones driving all over the country to race," said Thiesse "this one is five minutes from our shop!" 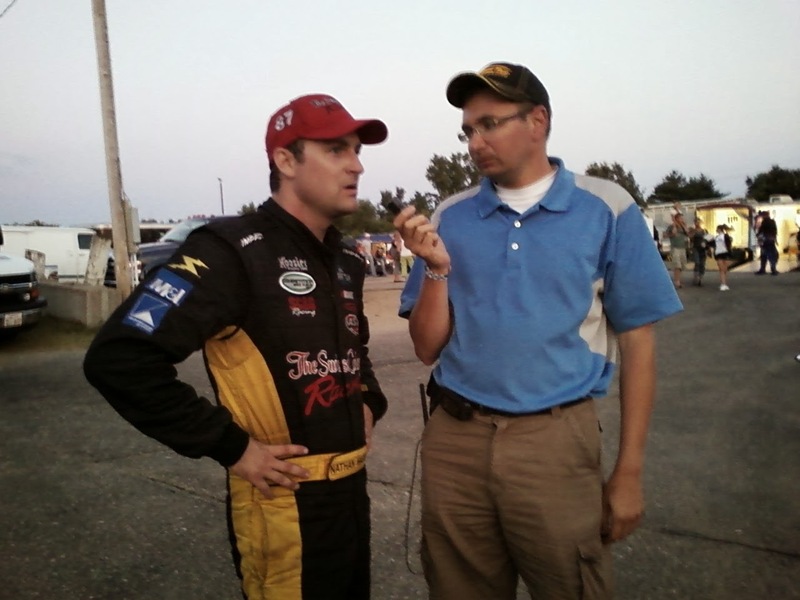 Listen weekly interviews with drivers from Raceway Park in Shakopee (MN) on Speedtalk Extra. 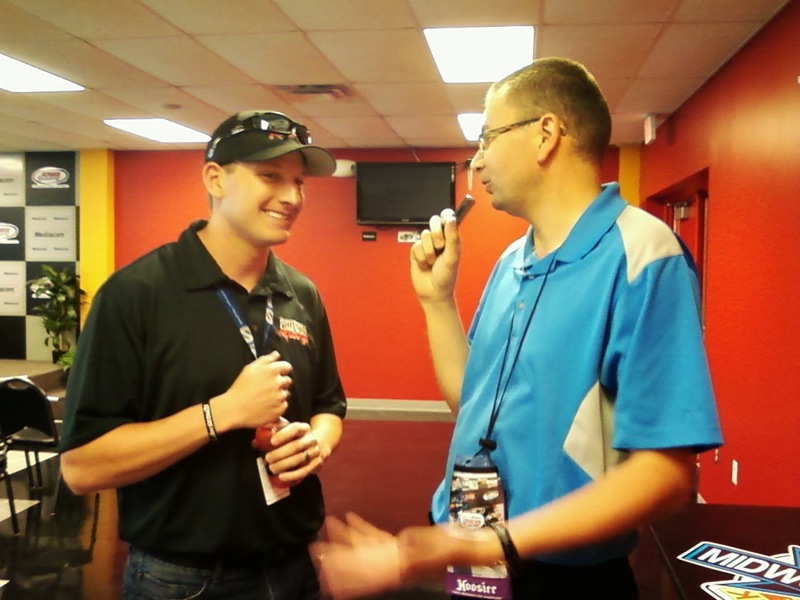 Jason from "Speedtalk on 1360" will interview a different driver every week. 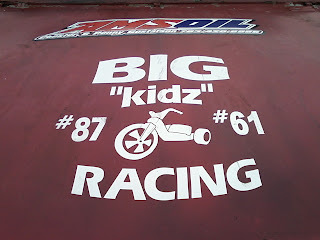 This segment is sponsored by Mark Bronstad and Todd Wilson and their race team "Big Kidz racing." 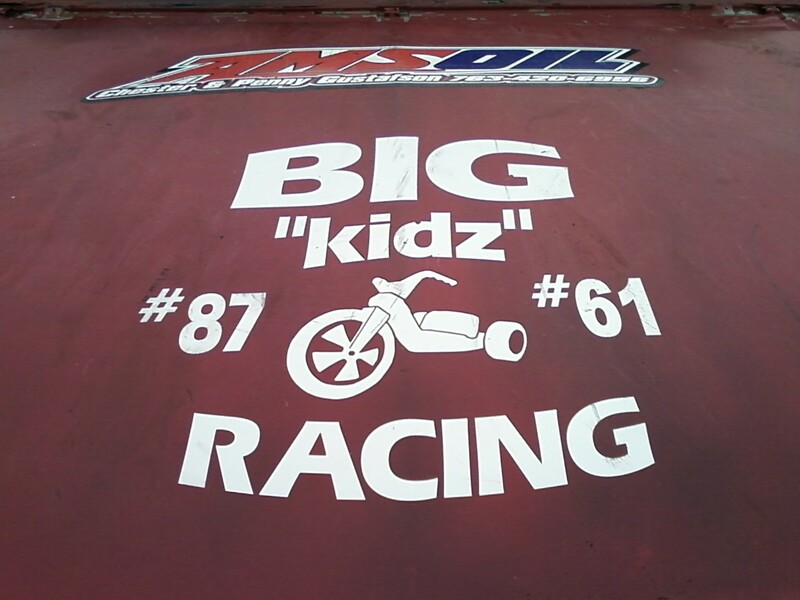 The race team is supported by Turtles Bar in Shakopee, Discount Taxi, Dayna's Darlings Daycare and Chester and Penny Gustafson your local AMSOIL dealer. Please support these sponsors so we can continue to promote racing in MN. Here is the schedule of driver interviews so far.